It's here, The 2014-15 Electric Winter Series!! Gates open tomorrow at 7am, racing starts at 10am!! Alok suggested a great option using the link from rccarevents.com Here it is http://www.rccarevents.com/event_details.cfm?event_id=2273 You will have to create a user id, but you can download an app to your phone and register via your phone. You can pay via paypal and be done with it!! No line to stand in!! or you can just register and pay at the track. Great resource. See you at the track!! Gates open at 7am, practice until 9:30, racing starts at 10am. Nitro started on time at 10 10:15. Would think electrics the same. You can sign up via phone or the link Kraig posted (I did the same for the nitro race this week). what time does racing start on saturday? i see under the event listing it says 6:00am, but i'm assuming that's when the track opens (practice)? Finally had time to throw down some laps yesterday. Track is a lot of fun. Different than anything before. Love it. Looking forward to the Winter Series. This Saturday will be RD1 of the Nitro Winter Series!! Time to fire up those buggies & truggies!! The track surface is holding up extremely well with tons of traction, gates open at 7am you can pre-register here: http://www.rccarevents.com/event_details.cfm?event_id=2272 or call the store at 925-778-2966. You can also register the day of the event. The race was fun. Not a huge turnout but track conditions were perfect. The new dirt held moisture and almost no tire wear. Clay compound were dialed. Some guys also ran super soft and did well. Ken did a great job on the layout as usual. Going to be a fun indoor series. any video from the race on the indoor track ??? The Electric Winter Series will kick off on Dec 20th. The track conditions are stellar right now. Traction is high and the track is holding up extremely well. We have started a new process to ease driver registration. The events can be viewed on rccarevents.com you can download an app to your smart phone and view not only events at Delta RC but any track that is in the rccarevent network, Check it out!! Don't worry you can still sign up the day of the event or even by phone in advance by calling the store at 925-778-2966. The new layout is in!! The dirt has a higher clay content and is holding up extremely well. Next weekend will kick off the Winter Series starting with Nitro!! Gates open at 7am, practice 7am to 9am with registration from 8am to 9:30am. Racing starts at 10am. What tires are working at the new indoor track? Preferably 2wheel buggy. There is a new way to view the weekly events going on at Delta RC. Log on to the website at www.deltarc.com and click on the calender link. This will allow you to view the daily status of events at Delta RC. Less then a week left till the 2014 Goldenstate Arenacross. The layout is being built as this post is made. Expect something different from the norm. Layout will be fun and racy, wide lanes. Here is hotel info. Are the off-road tracks still usable? If so, are they open for practice this weekend (Fri, Sat, Sun) and what are the times? Just a reminder Delta RC will open Monday 11/24 to kick off the week long sale, hours are 11am to 8pm. Gonna mix it up a bit. 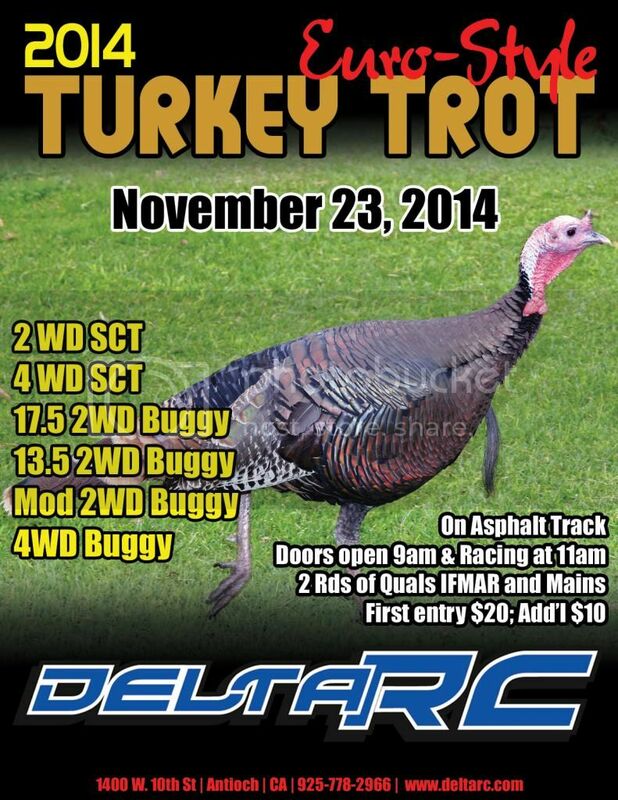 Were going to run the offroad classes on the indoor asphalt track for this year's turkey race. Sunday 11/23. We'll make it interesting by adding in some wood jumps. Turkeys and pies to the top three. Game on Euro style!!! It's that time of year again!! 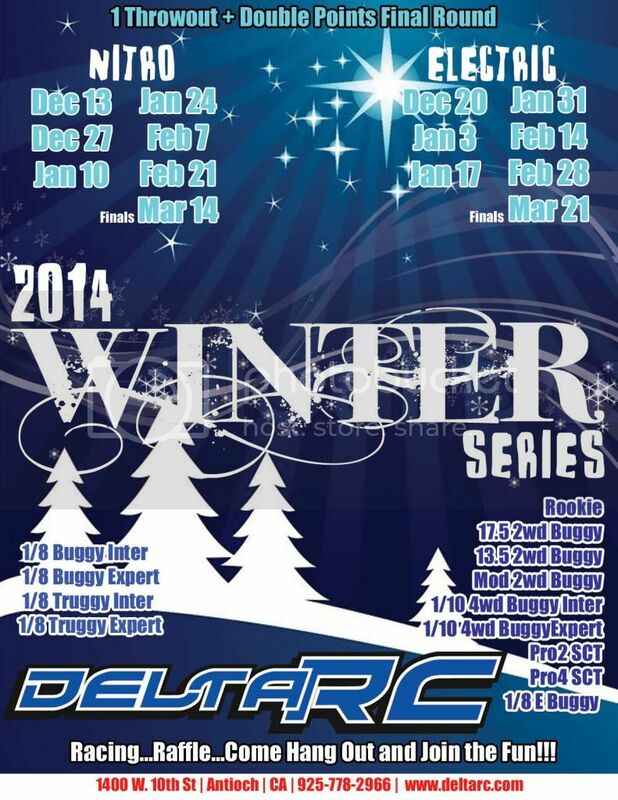 Here is the flier for the 2014-2015 DRC Winter Series. The nitro series will kick off on Dec 13. Come on out and enjoy great racing, meet some new faces and catch up with old ones, maybe win something in a raffle.